1st sQuba | What Car? Eureka! It's an underwater car. Haven't the designers of this 750,000 machine missed something, though... such as a roof, perhaps? Actually, no - although the car has been inspired by the underwater car in the James Bond film 'The Spy Who Loved Me', there'll be no drinking dry Martinis in it - it had to be open-roofed for safety reasons. The sQuba is powered by electric motors that can power it at depths of up to 30 feet. Passengers will be able to keep breathing when underwater through an on-board tank of compressed air, although Rinderknecht concedes they may prefer to stop and put on a wetsuit before submerging. 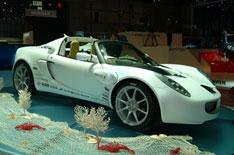 On land, the car is capable of 77mph, but it only travels at 3mph on the surface of the water and 1.8mph underneath it. It does not need to be on the sea bed to move, however, as its motors can propel it like a submarine. Rinderknecht says the prototype has cost about 750,000 to build, but refused to be drawn on the cost of a production model. 'It would be less than a Rolls-Royce,' he said.